Kent State University (KSU) is in the unique position of being both a top employer in the region and a leading institution of higher education. With nearly 6,800 employees, it's the number one producer of college graduates in Northeast Ohio with an alumni network that exceeds 230,000. As one of the largest university systems in the nation, KSU is listed among the top 100 public universities by U.S. News and World Report. Comprised of eight campuses with more than 41,000 undergraduate and graduate students from more than 111 countries, KSU is concluding a historic initiative to modernize existing facilities and add 21st-century buildings that will serve students for decades to come. To capitalize on this rising trajectory and momentum, the university launched the strategic plan A Strategic Roadmap to a Distinctive Kent State in 2015. Beverly J. Warren, Ph.D. was named president of KSU in July, 2014 after serving as provost and senior vice president at Virginia Commonwealth University. In her first two years at the helm, Dr. Warren has led a campus-wide rebranding effort, established collaborations with other Ohio universities, and facilitated more connectivity between the university's eight campuses. 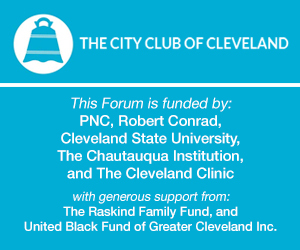 For this City Club Forum, Dr. Warren discusses the making of meaningful voice in tomorrow's leaders.